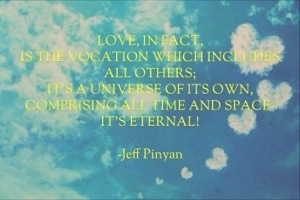 The Greatest Vocation of All! I ran across the above quote last weekend and had to share it! 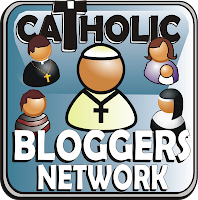 It expands perfectly on my post about vocations from last Friday! It’s also timely, considering yesterday was St. Valentine’s Day – a day all about LOVE! For the Year of Faith, I signed up for the daily e-newsletter, Read the Catechism in a Year, and Day 122 held this amazing paragraph by Jeff Pinyan. If the Church was a body composed of different members, it couldn’t lack the noblest of all; it must have a Heart, and a Heart BURNING WITH LOVE. And I realized that this love alone was the true motive force which enabled the other members to Church to act; if it ceased to function, the Apostles would forget to preach the gospel, the Martyrs would refuse to shed their blood. LOVE, IN FACT, IS THE VOCATION WHICH INCLUDES ALL OTHERS; IT’S A UNIVERSE OF IT’S OWN, COMPRISING ALL TIME AND SPACE – IT’S ETERNAL! In addition to reading this last Saturday, I heard a visiting Franciscan priest speak about this same topic at Mass on Sunday. He emphasized respecting others as the way to show love. No matter who we are or what job we have, we are all called to love one another. Sometimes we get caught up in finding our passion and the right career, but no matter how old or young, rich or poor, etc., we can always make it a priority to show love through our everyday actions and treatment of others. Have a great weekend full of love, everyone! So good! Thanks for sharing this quote!